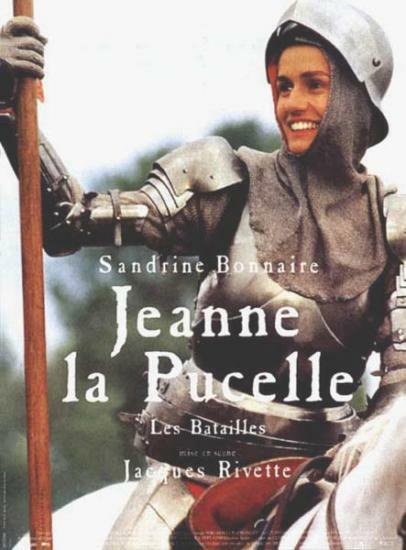 Posted in Free instant access, Instant Access, Movies, Streaming videoTagged DVD, Jacques Rivette, Jeanne d'Arc, Joan of Arc, Joan of arc movie, Joan of arc movies, Sandrine Bonnaire, streamingBookmark the permalink. As one might expect, this French film avoids the typical musical embellishment and special effects associated with a Hollywood style. It proceeds through Joan’s story at a leisurely pace (read: long and slow-moving) so the viewer has time to digest more about the context and characters surrounding Joan. Most of the film is shot in a straightforward story-telling style, but occasionally it flashes forward to a character we just saw in action now older and reflecting documentary style for the camera. I recognized many of these bits as coming straight out of the testimony witnesses gave at her nullification trial, which tells us that the specific character and the interactions we had just seen were also real. Likewise, I recognized many of Joan’s lines as direct quotes from her own documented words. Rather than showy special effects, the film is rich in subtle foreshadowing, cinematic symbolism and nuanced scenes that show the conflicting interests and concerns of the real people in the context of Joan’s story. The film does make some unusual choices about what to include and not include – it spends 16 minutes on rich visuals of the coronation ceremony but shows almost nothing of Joan’s trial. The free YouTube versions have excellent picture quality, but the volume level is so low I had to max out the volume on my speakers.